1) The finished work of the Founding Fathers was to establish and order liberty, tasks completed by the American Revolution and the creation and implementation of the Constitution. Their unfinished work, a responsibility that every subsequent generation must shoulder, is to sustain the free institutions that the Founders created and to preserve the political liberty that they bequeathed to us, so that we may convey it undiminished to our children and our children’s children. 4) Such a negative environment is fertile ground for tyranny. Ambitious individuals will inevitably arise from time to time, men (or women) who will “thirst for distinction” and who will attain it, if possible, at whatever cost. When such a figure arises, Lincoln maintained, “it will require the people to be united with each other, attached to the government and laws, and generally intelligent, to successfully frustrate his designs.” When these attributes are not in place, the people may actually embrace the future tyrant and become active agents in their own downfall. So what are we to make of this? Did Lincoln share observations with his audience 178 years ago that we need to hear today? Since beginning this blog three and a half years ago, I have tried hard to avoid partisanship, both religious and political. I have called out evangelical writers who exaggerate our nation’s Christian heritage (as here, for example), just as I have contradicted secular writers who would understate it (as in this post). In the realm of politics, I’ve kept my distance from current debates, even though that is the fastest way to build an online following. When history gets caught up in political conflicts, it can quickly become just another political tool, a rhetorical weapon valued more for its usefulness than its accuracy. I detest this history-as-ammunition approach to the past. Whenever I further it, I am abusing my responsibility as a historian. But at the same time, when careful study of the past points me toward insights that are relevant to the present and I refuse to share them, I am abdicating my responsibility as a historian and violating the law of love in the process. And so, although I am committed to making political statements as sparingly as possible, in this post and the next one, I am going to do so candidly. A word of qualification first: Abraham Lincoln was neither politically nor morally infallible. Nor was he an unerring prophet, a nineteenth-century Nostradamus who left us clues concerning our future if we parse his words carefully. But Lincoln did go on to prove himself a statesman of unusual ability, and in so doing he earned our attention. We don’t have to listen to him slavishly—asking “What would Lincoln do?” so we can go and do likewise—but we should listen to him respectfully. If history, at its best, can be a “conversation with the dead about what we should value and how we should live,” as David Harlan puts it, Lincoln surely deserves to be a part of that conversation. So are Lincoln’s warnings of nearly two centuries ago something we should heed today? Absolutely. In particular, pay attention to the third and fourth principles in his address. First, if “attachment to the Government” is crucial to the functioning of a free society, then Americans in 2016 are in a bad way. 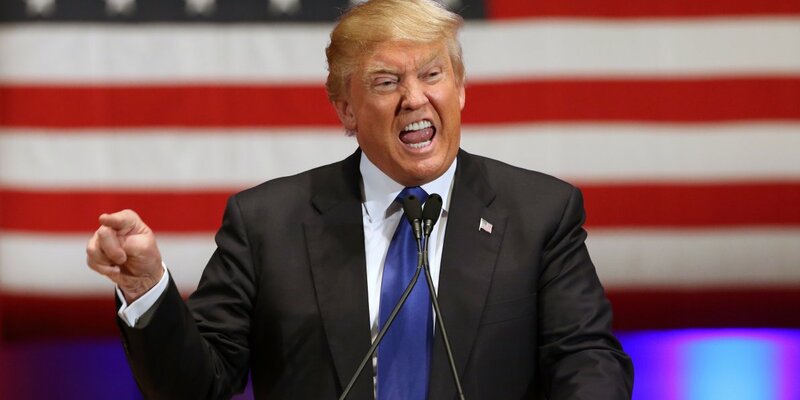 If it has shown anything, the presidential campaign to date has demonstrated the magnitude of popular disgust with politics as usual. On both extremes of the political continuum, huge segments of the electorate are convinced that our national political institutions are obstacles to social justice and must be “taken back” from the special interests that control them. Opinion poll data put such views in long-term perspective. According to data collected by the Pew Research Center, the proportion of Americans expressing trust in the national government has fallen to a historical low. As late as 1964, 77 percent of Americans surveyed reported that they trusted the government in Washington “to do what it right” all or most of the time. Can you imagine that? Today that proportion has fallen to 19 percent. Popular trust began to fall off sharply after the Kennedy-Johnson years, thanks largely to Watergate and Vietnam, and although it has fluctuated sharply from time to time, the overall trend since then has been decidedly downward. By the fall of 2015, distrust of the federal government was rampant across the population. The Pew polling data provides percentages for a broad range of population categories, dissecting the nation by race, ethnicity, age, education, and political affiliation or leaning. At present, there is not a demographic category in the nation in which as much as 30 percent of respondents profess to trust government all or most of the time. As polarized as Americans now are, they do share this much in common: they are profoundly distrustful of their national government. If Lincoln was right, and “the attachment of the people” is the “strongest bulwark” of the government, then we live in a nation in crisis. “So what else is new?” I can hear you thinking. Aren’t we perpetually bombarded by voices from all sides raising just this alarm? Not exactly. Oh sure, it is impossible to listen to the talking heads on talk radio or cable news or to any of a long list of political candidates without hearing dire warnings about the state of the nation and the logjam in Washington. But the subtext of such jeremiads is almost always that things can be made right again simply by a change of personnel. All that prevents us from restoring hope or promoting social justice or “making America great again” is the victory of the correct candidate or party or movement. The message, in sum, is that popular attachment to the government will be restored just as soon as the officeholders in Washington get their act together and start deserving our trust again. Perhaps Lincoln would be sympathetic with such a posture if he could survey the political landscape in 2016. We’ll never know. What we can say for sure is that this is not what he had in mind 178 years ago, not remotely. The thrust of Lincoln’s Lyceum Address is that the People themselves can also be responsible for an erosion of trust in the government. Popular attachment to the government is not just something that happens when government does its job. Lincoln believed that attachment to the government was an indispensable political quality that Americans should constantly, consciously cultivate. “How shall we fortify against” the loss of faith in government, Lincoln asked? We do so, he maintained, by promoting respect for the rule of law and by replacing passion in the public square with reason. “Every lover of liberty” should swear to honor the law, Lincoln lectured his lyceum audience. The people should purpose to make “reverence for the laws . 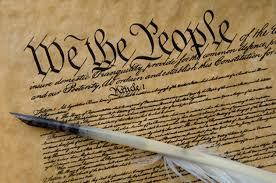 . . the political religion of the nation.” This didn’t mean blind submission to every government edict. Lincoln would not have counseled civilians in Nazi Germany to give unqualified obeisance to the Fuhrer. “Let me not be understood as saying there are no bad laws,” he elaborated, “nor that grievances may arise, for the redress of which, no legal provisions have been made.” Such realities will exist on occasion. (Lincoln certainly believed that such was the case in 1838.) But in the midst of such circumstances, Lincoln called for a public mind that patiently addresses injustice within the rule of law, working to alleviate ills without violating the Constitutional forms necessary for liberty to flourish over the long run. When such a demagogue arises, remember that Lincoln predicted that three popular qualities will be necessary to “successfully frustrate his designs.” “It will require the people to be united with each other, attached to the government and laws, and generally intelligent [i.e., guided by reason]. Surely Americans in 2016 fall short on all three counts, which is why the Republican Party faces the appalling prospect of a “presumptive nominee” with no appreciable qualifications for the job but a prodigious talent for channeling popular passions, chief among which are fear, resentment, anxiety, and hatred. Did Abraham Lincoln predict the rise of Donald Trump? No, not specifically. But he absolutely nailed the conditions necessary for such a travesty to occur. I’ll elaborate in my next post. In the meantime, I’d welcome your thoughts. Once again, it’s been forever since I last wrote to you. Life keeps getting in the way—commencement, end-of-year reports, and two serious family illnesses have conspired to keep me away. Since I last wrote, there have been a couple of on-line conversations about Americans’ declining interest in history that I would like to weigh in on, but for now I just want to pass on a couple of intriguing quotes from my summertime reading, which is only now really getting under way. I’ve already told you that one of my goals for the summer is to work through the eight volumes of the papers of Abraham Lincoln. I am not really going through them word by word, but reading with a particular eye to what Lincoln had to say about democracy, patriotism, and faith. I get to speak at a church in Gettysburg this November, on the 153rd anniversary of the Gettysburg Address, and I’m searching for inspiration. My goal is to find something to say about Lincoln that is not only worthwhile but also wholly original, and since there’s been so little written about Lincoln, I don’t think this should be too hard. Wouldn’t you agree? At any rate, I’ve been taking notes on the first volume, and I wanted to share a few passages from one of Lincoln’s earlier public addresses, his 1838 speech before the Young Men’s Lyceum of Springfield, Illinois. Lincoln was not quite twenty-nine when he spoke to this local civic organization. He had recently begun the practice of law and had already completed two terms in the state legislature, so he already had a fair amount of “stump speaking” under his belt, but on this January evening he was clearly trying to deliver something more formal and polished than the norm. His audience was non-partisan, and Lincoln’s goal was less to promote a political agenda than to articulate widely held beliefs and, more than likely, practice his elocution. One of my goals for this summer is to work through the eight volumes of the papers of Abraham Lincoln. I recently finished the first volume, which covers Lincoln’s life to 1848, and I’m taking vol. 2 with me when I head out momentarily on a road trip to see my dad down in Tennessee. Volume 1 was a bit tedious. A fair amount reflects Lincoln’s early law practice, so much of it involves correspondence with clients over small-potatoes legal cases–suits for unpaid debts and disputed property boundaries, etc. But you can already see glimpses of Lincoln’s political values and his political world, and this part is fascinating. Sam Wineburg (author of one of my favorite books of all time, Historical Thinking and Other Unnatural Acts), says that our forays into the past always involve encounters with both the familiar and the strange, and that certainly applies here. Two of the themes of these early papers are partisanship and patronage. Lincoln was fiercely loyal to the Whig Party during the 1830s and 1840s, and he repeatedly criticized those who would claim to support the party without submitting to party decisions. The latter part of the volume covers most of Lincoln’s lone term to the U. S. House of Representatives, and much of his writing during that period pertains to political appointments–responses to office-seekers appealing for his aid or letters of recommendation on their behalf. This sounds familiar, doesn’t it? 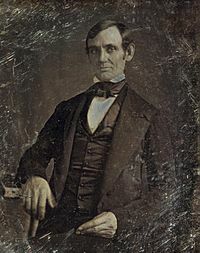 The earliest known picture of Lincoln, taken around the time of his election to Congress in 1846. But there is also much that feels strange–passages that remind us that we wouldn’t feel at home in Lincoln’s world, nor would he be entirely comfortable in ours. His speeches were far longer, far more complicated, and far more substantive than the sound bites and slogans we take for granted today. His arguments for transportation projects and protective tariffs were more than appeals to self-interest, but rather detailed rationales designed for thinking audiences. 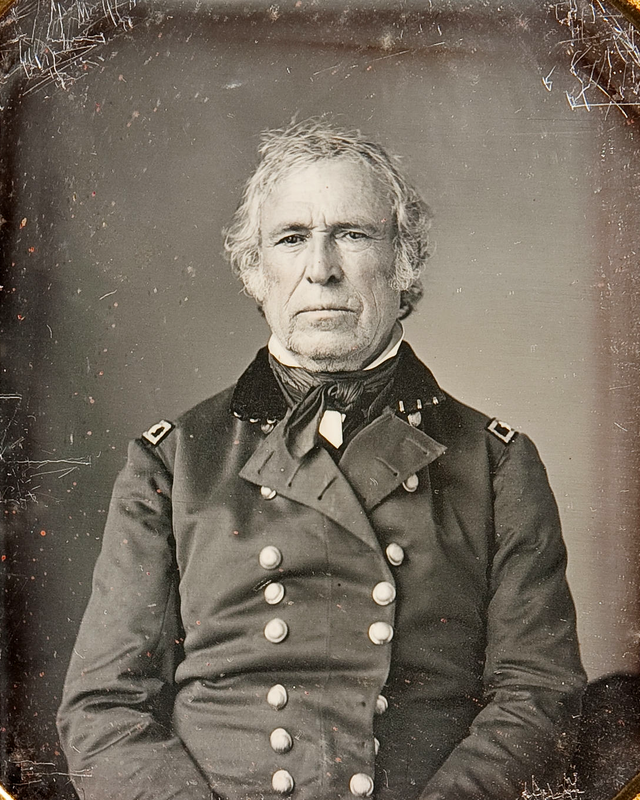 How would we respond to a presidential candidate today who took such a position? My guess is that we would be suspicious, if not appalled. But why is that? What does this say about us and the political system we take for granted? The framers of the Constitution did not expect the president of the United States to be, by definition, the leader of a political party (they opposed political parties generally), and in the system of checks and balances that they constructed, they envisioned that the role of the president would be not to make law but to execute it. In sum, while the founders hoped that the electoral college would select individuals of wisdom and integrity to fill the president’s chair, they never dreamed that the nation would someday expect candidates to fashion elaborate policy proposals or make innumerable pledges of what they (seemingly alone) will accomplish immediately upon taking office. We look to the president to be our political savior. The founders’ understanding of the office was rather more modest. I’ve been thinking about these words from Alexander Hamilton quite a lot this election season. He was referring to the angry debate over the newly proposed Constitution, but in many ways his description of the political climate in 1787 sounds a lot like 2016. Indeed, the quote above, originally published in a New York newspaper over the pseudonym “Publius,” could come straight out of the op-ed section of one of today’s newspapers, except for the fact that columnists can’t use words like “declamation” and “invective” any more and hope to be understood.